Think of your master’s program as the foundation for your entire career. It’s the gateway to meeting your pre-professional experience requirements and it qualifies you to take the Praxis exam required for state licensure and the CCC-SLP. And if you plan to work in the schools, even all this is just a step to the additional licensing you’re going to need. There’s a lot to accomplish before you can call yourself a speech-language pathologist and tag those credentials on at the end of your name… and it all starts with your master’s degree. Everybody knows you need to choose a program that’s been accredited by the Council on Academic Accreditation (CAA), the accrediting arm of ASHA. You can be sure any program that’s earned that CAA stamp of approval meets ASHA’s exacting standards. But we’ve been talking to prospective SLP grad students at that critical stage when they start seriously considering their options, and what we’ve discovered is that they want to know quite a bit more before making a decision. Today’s savvy grad students understand that an advanced degree is an investment in the future, and they’re doing their due diligence to make sure it’s a sound one. If only you could find everything you need in one place so you could make a meaningful side-by-side comparison of all these CAA-accredited programs – things like Praxis exam pass rates and employment rates among graduates, program completion rates, info on the kinds of practicums the program offers… and, of course, cost. NYU Steinhardt's online MS in Communicative Sciences and Disorders, Speech@NYU, offers a comprehensive curriculum that combines research and evidence-based clinical practice in a flexible online format. Speech@NYU prepares students across the country to become creative, collaborative, and effective speech-language pathologists. Students of this program will gain the experience needed to provide care to diverse populations across the life span. GRE Required. Request information. Emerson College offers an online master’s in speech-language pathology with the same curriculum as its top-ranked* on-campus program. Students are prepared to pursue SLP certification in as few as 20 months. GRE Required. Baylor’s SLP master’s program online can be completed full time in 20 months or part time in 25 months. 100 percent of on-campus graduates pass the Praxis and become employed. Bachelor’s and GRE required. Cost and affordability – We started by finding the average yearly tuition for schools offering SLP grad programs in each state, looking at the cost of state and private universities separately. This means that our cost assessment is always based on a comparison of tuition rates for either public or private schools within a given state, not just some arbitrary review of which school offers the lowest cost program. This ensured we made an apples to apples comparison. We also gave a nod to schools that offer comparable tuition rates to students regardless of residency status, something we feel is worth considering as more grad students shop for programs from throughout the country and more international students come to the U.S. for their graduate work. Some public universities are even beginning to offer grad programs at in-state rates regardless of residency status as a way to attract students and remain competitive. On our 100-point scoring scale, cost and affordability represents 30 possible points. Student achievement – Praxis exam pass rates, on-time completion rates, and employment rates speak for themselves and represent the most concrete metric available for assessing the quality of a program. CAA requires schools to post student outcomes for the three most recent years – so we made our assessment based on the 3-year average for each of the student achievement categories: percentage of students graduating on time … percentage of graduates that pass the Praxis exam …. percentage of those that go on to land jobs immediately afterward. Student achievement is worth a total of 70 points on our 100-point scoring scale, with 30 possible points for Praxis exam pass rates, 30 possible points for employment rate, and 10 possible points for on-time completion. Want to know more about our scoring system? Take a look at this. We identified more than 100 programs that scored 80 points (B-) or better, and we think they deserve some recognition. So here you have it, our 2018 list of the best accredited master’s programs in SLP and Communication Sciences and Disorders available in the U.S.
Arkansas State gets top marks across the board for Praxis exam pass rates, on-time program completion, and job placement rates among graduates—100 percent in all categories. Graduates rave about their experiences in the program, including the in-depth, hands-on practical training at the on-campus A-State Speech and Hearing Center, which offers free diagnostic and therapy services to local patients dealing with issues related to speech and swallowing. We don’t know of any other school out there that offers the same in-state tuition rate to all students who maintain a 3.0 minimum GPA. That’s right— as long as you keep your GPA up, even as an out-of-state student you’ll pay the in-state rate without having to meet residency requirements! Marywood’s tuition is among the most attractive of any school on our list, which is all the more impressive considering the pedigree of this private university. Marywood is also an excellent choice for continuity in education. Sure, you can enter the master’s program as a regular grad student, but the school also offers the MS in SLP as part of a combined 5-year program that includes a 3-year pre-professional track in which undergrads first earn a bachelor’s degree before transitioning to the graduate program. As a student entering as an undergrad, you would stay with the same cohort for the entire program, something that would allow you to forge strong bonds that could last throughout your career. Add to that the fact that Marywood earns perfect marks for student achievement and it’s clear this school earns an easy A+. As one of the premier private research universities in the country, Vanderbilt doesn’t really need much of an introduction. Vanderbilt’s SLP master’s program is a hidden gem in the heart of this Nashville institution, and it shouldn’t be overlooked. In addition to superlative student achievement statistics, some of the great strengths of the Vanderbilt program are the variety of clinical training venues available to graduate students. The Vanderbilt hospital system has specialized venues for otolaryngology and pediatric treatment as well as the usual array of healthcare programs, any of which can support clinical or research externships. This gives students a wide selection of specialty training opportunities, which are further complemented by dedicated training tracks and elective courses that focus on areas like autism or feeding and swallowing disorders. The MS in Speech-Language Pathology program through Bloomsburg University has held ASHA-CAA accreditation for more than 25 years and has recently renewed its accreditation status to run through 2020. There are a variety of courses offered through this program that allow students to focus their grad program on particular areas like Voice Disorders, Craniofacial Disorders, and Motor Speech Disorders. Students rave about their Clinical Instrumentation in Speech Pathology course, which provides students with hands-on experience with videostroboscopy and nasometry. This Christian school takes instruction in the healing arts seriously. Their pass, completion, and graduate employment rates all come out near the top of the stack, leaving them with a high A rating in our scoring system. But although their academic programs are strong, Calvin College’s real strengths lie in their students. As a liberal arts college, Calvin provides a breadth of experience and education that is second to none. The school has a particularly strong chapter of the National Student Speech, Language, and Hearing Association and strong ties with veteran’s programs and other off-site facilities that offer SLP externships. Participation in off-campus programs is strongly encouraged, such as assisting with the IDIS W11 Adoption and Foster Care program for Chinese children. Students of this program travel to China for an opportunity to both learn and serve by assisting with special needs children, a type of practical experience in both life and SLP that few other programs can match. Duquesne offers a five-year accelerated program that guarantees both a bachelor and master’s degree in SLP, offering the advantages of a fast-track with a stable cohort and instructors. But that’s only one reason to consider this private Catholic University. The school gets an A grade for high Praxis pass rates, high post-graduation employment rates, and solid on-time completion rates, all at a very affordable price for a respected private institution. The Rangos School of Health Sciences is one of the newest colleges at this nearly 150-year-old university and has state-of-the art research labs and facilities. The Speech Perception/Production & Innovative Technology Lab, for example, allows students and faculty to work with advanced software, including a number of tools for designing custom therapy materials. As a student of East Stroudsburg, you’ll enjoy access to the Speech & Hearing Center and placements at medical facilities and schools, both locally and across several states in the region. In fact, the school has affiliation agreements with more than 70 facilities in Pennsylvania, Delaware, New Jersey, New York, and Maryland. As a student here, you’ll also enjoy the distinguished status that comes with being part of an established program that’s been producing first rate speech-language pathologists for more than 50 years. We are big fans of Indiana University’s MS in SLP program because it offers the best in clinical experiences for students, something we’re sure must contribute to the 100% Praxis exam pass rate and 100% employment rate among graduates. In fact, all students here are supervised and mentored by faculty members right on-site in the Speech, Language, and Hearing Clinic. We also love the fact that more than half of the students here receive graduate assistantships, which includes partial or full tuition remission and a stipend. This esteemed North Dakota public university easily earned a spot high on our list. A special destination, Minot State University is located in western North Dakota and is home to a superlative program in communication disorders, one of the largest in the Midwest. This program turns out a highly-recruited pool of graduates each year and boasts a completion rate of better than 96 percent. The program places students in externships throughout the U.S. and Canada, and has a 100 percent employment rate for graduates largely because most interns are offered full-time positions upon completion. MSU has the only Vocal Function Laboratory in the region and students score well above average on the Praxis exam. All of this comes at just over $8,000 a year in tuition (all students pay in-state tuition), a drop in the bucket compared to many of the schools on our list. Northeastern is a private research university that has a strong tradition of practice-oriented education. The SLP Graduate Program, as part of the Bouvé College of Health Sciences, emphasizes teamwork and interdisciplinary approaches to providing therapy for communication disorders. The on-campus Speech, Language, and Hearing Center in the Behrakis Health Sciences Center offers state-of-the-art assistive technology and software for providing diagnostic, therapeutic, and clinical services. This active, hands-on approach, taught by internationally recognized instructors in one of the foremost centers for the study of communication disorders on the East Coast, is a key element to the program’s effectiveness. The school manages a 100 percent pass and job placement rates for graduates despite turning out cohorts of more than 40 students a year, double what many other programs handle. This quiet, non-profit university located outside San Bernardino includes a gem of a speech-language pathology master’s program that gets an A rating on our ranking system. Affordable tuition combined with 100 percent Praxis exam and post-graduation employment rates make Redlands a solid choice for anyone looking for warm, collaborative educational opportunities in SLP. A regular speaker series keeps students and staff alike abreast of the latest developments in the field. In addition to the common accreditation from the Council on Academic Accreditation in Audiology and Speech Language Pathology, the program also meets requirements set down by the California Commission on Teacher Credentialing for Speech-Language Pathology Services. The University of Tulsa SLP master’s program combines excellent Praxis exam pass rates with strong on-time completion rates and a 100 percent employment rate among graduates to make it an excellent choice for students in the heartland. As a private research university, TU has a strong reputation for involving both graduates and undergraduates in research efforts. This means you’ll get a front row seat to cutting-edge exploration of SLP issues and therapies. Admission to the school is highly competitive and with good reason—it’s known for a high percentage of very successful students, with multiple awards of Fulbright, Rhodes, and Marshall scholarships among the student body in recent years. St. Ambrose is serious about getting students involved in hands-on clinical work as soon as possible. First-year students can expect to be out in the field dealing with real-world speech pathology issues at the university-run Rite Care Clinic, or at the Rock Island School District, where graduate students are paired with SLPs in three local schools. A number of other local opportunities are also available, ensuring you get the full picture of what it’s like to work professionally in SLP right from the start. The experience pays off—St. Ambrose students enjoy a 100 percent pass rate on the national standard Praxis exam and a 100% employment rate after graduation. The program continues this commitment to excellence with an option to study abroad in Ecuador through an exchange program with the University of Cuenca, bringing additional cultural experience together with hands-on practice for a more well-rounded education. Saint Xavier is a private, Roman Catholic university with a strong focus on academic rigor. It’s also an institution with a strong commitment to diversity, with one of the most diverse student bodies in the already diverse Chicago area, a factor that allows students from all backgrounds more opportunities to understand the cultural and linguistic factors that can effect the diagnosis and delivery of therapies for SLP issues. For hands-on clinical experience, the university partners with more than 250 schools, hospitals, and rehabilitation facilities in the Chicago area, where students practice under the supervision of ASHA-certified instructors and providers. Case Western is a highly respected private university with a long history of cranking out Nobel laureates… 17 have graduated from or taught at the school since 1907, 8 of them in medicine. As part of that proud tradition, the communication sciences program focuses on turning out highly competent clinician researchers with integrity, high ethical standards, and ongoing intellectual curiosity. The school’s chapter of the National Student Speech, Language, and Hearing Association has achieved Bronze Status with that organization by working inside and outside the program to bring awareness to communication disorder issues. Co-located at the Cleveland Hearing and Speech Center, the communication science graduate program here gives students first-hand access to real-world cases, tools, and techniques. You can get a sense of just how dedicated Emerson College is to the art and science of speech and language when you consider that it was established in 1880 expressly as a school of oratory. The school has been focused on speech and language disorders for almost as long—the Department of Communication Sciences and Disorders celebrated its 80th anniversary in 2015. It’s no surprise, then, that the school awarded 41 master’s degrees in 2016, almost twice that of the average program, and still had a 100 percent Praxis exam pass rate. The CSD Department at Emerson has a record for finding every single one of its graduates a professional position they love. That sort of consistent, deep expertise and experience marks Emerson’s program as one of the best in the nation. For a small private university, Our Lady of the Lake has a big SLP program! The new Elizabeth Carrow-Woolfolk and Robert M. Woolfolk School of Communication Sciences and Disorders graduated 25 students in 2016, with a nearly 95 percent on-time completion rate. That number is even more impressive when considering that every single one of those students both passed the national standard Praxis exam and found professional positions in the field after graduation. Our Lady’s program also distinguishes itself by offering a bilingual SLP option, providing the knowledge and clinical skills required to offer assessment and intervention in both Spanish and English. This includes options for a Spanish-language clinical practicum and extra specialty coursework. ACU offers their master’s degree in SLP both at the Abilene campus and its satellite campus in Addison, near Dallas. The program is nationally recognized and you can expect clinical placements in Abilene or the Dallas/Fort Worth area. As a private Christian school, ACU does not neglect the spiritual tradition as it applies to therapy and healthcare, while also taking full advantage of modern technology. In 2008, the university was the first in the country to announce that it was providing free tablets to incoming students. The CSD department is also in the process of maximizing services available through its on-campus clinic, something that’s likely to offer you even more opportunities to regularly interact with patients in an actual clinic. What’s not to love about Edinboro University’s MA in Speech-Language Pathology program? A 100% Praxis exam pass rate and a 95 percent employment rate among its recent graduates speaks to the quality of the program and its commitment to student success. Add to that small class sizes and affordable tuition rates for both in-state and out-of-state students, and it’s easy to see why Edinboro’s SLP program has earned a solid reputation for being a high quality program that delivers results. Founded as a Catholic women’s university in 1923, Fontbonne has gone co-ed and all-in on communication disorder education. Through the on-site, free, non-profit Eardley Family Clinic for Speech, Language, and Hearing, students have an opportunity to work with a broad spectrum of patients from around the St. Louis area with an equally broad spectrum of communication disorders. Students enjoy a focus on real-world clinical experience at Fontbonne through a program lead by internationally-recognized instructors. In fact, Dr. Susan Lenihan, professor and director of the university’s deaf education program, recently won the prestigious Branica Maxon Award for EHDI Excellence. The university has ties with more than 100 excellent externship facilities in the area that offer a range of focuses in different SLP practices. Two unique educational tracks are available through the program, for practice with deaf children and for working with adults with neurogenic communication disorders. From its founding in 1864, Gallaudet has been focused on the needs of the deaf and blind, so much so that even today it remains officially bilingual in ASL (American Sign Language) and English in all instructional programs. Establishing a strong program in SLP was a natural outgrowth for serving this population. Uniquely, Gallaudet was established as a private university by Congressional charter, and remains closely aligned with the Department of Education and Congress today—each graduate’s diploma is signed by the current president of the United States. Although it has a small student body, with fewer than 500 active post-graduates, and granted just 15 SLP master’s in 2016, entry is highly competitive. Gallaudet may be the only university in the country that requires SLP graduates to take courses in ASL and establish proficiency in working with deaf or hard-of-hearing adults and children. Loma Linda University’s MS in Communication Sciences and Disorders program includes scheduling designed for working grad students: summer study during the first year, with graduate courses taught in the late afternoon/early evening. In the second year, students complete their practicum placements in schools and medical clinics in the community. We also really love the Clinic Bootcamp offered here, a unique program designed to prepare students to hit the ground running. About 90% of the courses in this program use a Problem-Based Learning (PBL) format in which students discuss a case in groups, independently research an aspect of the case, and bring their collective findings together to draw conclusions. The PBL method helps promote deep learning and clinical problem solving skills. Loyola’s Department of Speech-Language Hearing Sciences turned out 50 SLP and audiology master’s graduates in 2016, a number that’s even more impressive when you consider the 100 percent Praxis exam pass rate they enjoyed and the fact that 99 percent of them found professional positions in the field after graduation. A private Jesuit school with a serious focus on academic rigor and hands-on experience, Loyola focuses on a holistic educational experience designed to foster personal, experiential and academic growth. That focus includes faculty mentorship for SLP grad students, ensuring that even in this large program each student gets individualized attention . Mercy is a private research university settled on sixty scenic acres alongside the Hudson River in Dobbs Ferry, New York. It offers a surprisingly affordable option with excellent outcomes for SLP master’s students: a 100 percent Praxis Exam pass rate among graduates, and completion and job placement rates of over 95 percent. Although the program is a large one, with 45 students graduating in 2016, each student has a faculty advisor that ensures they get individual attention during the program. In addition to the on-site speech and hearing clinic where all students participate in group research capstone projects with faculty mentorship, more than 150 facilities offer externship opportunities to SLP students at Mercy. Students here can also take advantage of priceless experience opportunities overseas. The non-profit foundation, Healing the Children, facilitates volunteer trips to Thailand, Peru, and Columbia where grad students get to work with kids with orofacial clefts who otherwise might never receive professional SLP services. MSU – Mankato is the flagship school in the Minnesota public university system and dominates the small town 75 miles outside of Minneapolis. If you’re looking for a place in Minnesota to hunker down and focus on your studies, MSU – Mankato is the place for you. It’s certainly one of the most affordable schools on our list, with annual tuition and fees of less than $8,000. Nonetheless, it’s a solid academic choice, with Praxis exam pass rates and on-time completion rates of better than 98 percent. It’s also a good investment if you’re looking for a degree that will definitely get you a good job after graduation—100 percent of Mankato’s SLP graduates are placed in jobs they love. This small, private college on New York’s Long Island has been expanding its facilities lately, which gives you the opportunity to study in a small cohort in absolutely top-notch labs and classrooms. With a high student retention rate and solid value for the tuition, folks who go to Molloy tend to stick with it. Graduates from Molloy not only enjoy a 100 percent job placement rate, but they also rank highly among top income earners after graduation—a study by Georgetown University put Molloy at #17 in the nation for highly paid graduates. The SLP program is about more than just money, however. You’ll also have the opportunity to travel on medical missions to places like Jamaica to assist instructors in providing SLP services to patients who might otherwise never receive therapy. Nazareth recently opened the York Wellness and Rehabilitation Institute, doubling on-campus clinic space and increasing research opportunities for graduate students in SLP and other healthcare programs. Students have the opportunity to perform hands-on diagnostic and therapy work in such specialized venues as the Audiology/Auditory Processing Diagnostic Clinic, Neurogenic Communication and Cognition Clinic, Kids Club, Language and Literacy Clinic, and the Speech and Language Clinic. The school also offers specialized interdisciplinary programs in autism and deafness if you plan to enter either of those sub-specialties after graduation. These opportunities are complemented by a regular overseas program that sends students to Ethiopia to work with deaf children and young adults. Rockhurst is a private Jesuit university that follow the precepts of instructing students not only in their chosen degree program, but in the general aspects of leadership and service. Ninety-seven percent of students participate in community service activities while at Rockhurst. As an SLP graduate student, your opportunities will largely come in the form of community-based practicum programs that deliver real-world training. The school partners with more than 125 clinical sites to provide students with experience throughout the community in practice settings that include rehabilitation, acute care, speech disorders clinics, and skilled nursing facilities. Founded in 1856, today Seton Hall is the oldest diocesan university in the United States. With that long history comes a large and distinguished SLP master’s program, graduating 43 students in 2016 at a nearly 100 percent on-time completion rate. The program’s job placement rate is also a sterling 100 percent and the university’s name on your diploma will carry a lot of weight with hiring committees. But it’s more than just reputation. The university has a broad array of specialized research laboratories where students hone their skills under the supervision of world-class researchers and instructors. Located in a culturally and ethnically diverse region, you will gain broader experience confronting a greater variety of challenges here than most schools can offer. We love Touro College’s MS in Speech-Language Pathology for many reasons, including the variety of clinical experiences offered here. Much of the clinical experiences here are completed right on-site through the Speech and Hearing Center, which provides a wide array of services to all populations in underserved communities. Add to that their 100 percent Praxis exam pass rate and 100 percent employment rate for recent program graduates, and it’s easy to see why Touro College made our list of the top speech-language pathology programs. Worcester is a public university in a working-class city that emphasizes the practicality of its program for graduate students facing the pragmatic challenges of the real world. Classes are scheduled in the afternoons and evenings to accommodate students working their way through school, and allow flexible scheduling at a part-time, full-time, or accelerated pace; whatever is best for your schedule. The price tag is also easy to swallow, coming in at just over $5,000 a year in tuition and fees. But these efforts to make life easier for working students don’t impact the quality of the education you get in Worcester. Graduates of the program have demonstrated a 100 percent pass rate on the national Praxis exam and a 100 percent job placement rate. Pacific University’s School of Communication Sciences and Disorders takes full advantage of its location in the greater Portland area, maintaining many community partnerships to provide SLP grad students here with ample opportunities to experience the best in clinical training along with amazing networking opportunities. We’re also impressed with its close faculty mentoring and its professional SLP clinical supervisors who ensure that students here always have the support they need to succeed. The 100% Praxis exam pass rate among graduates speaks for itself. Harding has provided education in communication sciences and disorders since 1953 and the experience shows. The department’s secret to success is in stressing direct contact between faculty and students, keeping graduate class sizes small and encouraging direct discussion of professional issues. Harding is a private conservative Christian school that also emphasizes charity and good works and Christian living as a part of the curriculum. Faith and learning are integrated, and this carries over to the overseas opportunity open to Harding grad students, known as the Harding in Zambia path. HIZ participants spend time in Africa working with children with HIV/AIDS who have complex swallowing or speech difficulties associated with the disease. If you’re looking for a top-notch education in the beautiful Shenandoah Valley, look no further… James Madison University’s gorgeous and rapidly expanding campus is a lovely place to learn your profession. With 100 percent job placement, on-time completion and Praxis exam pass rates, it’s also a very effective program. Turning out more than 40 students a year, JMU makes every effort to assist every first-year graduate student, automatically assessing them for placement in graduate assistantships, positions that provide tuition assistance. Louisiana Tech enjoys uniformly terrific scores for on-time completion, job placement among graduates, and Praxis exam pass rates… 100 percent all the way around. And they’re able to do it while still offering tuition rates to in-state students that are lower than the state average. The Louisiana Tech program offers comprehensive training in SLP diagnosis and therapy across the spectrum of specializations and patient populations. The Speech and Hearing Center here provides opportunities for hands-on experience working in a clinical setting with many of those populations, but the university also partners with external clinics and facilities ranging from general practice hospitals to public schools to pediatric therapy clinics. Marquette University immediately caught our attention because it is one of just a few universities to offer a bilingual English-Spanish specialization in their MS in Speech-Language Pathology program. We also love their dozens of clinical practicum affiliations, including the Center for Blind and Visually Impaired Children, the Children’s Hospital of Wisconsin, Condell Medical Center, and Lake Forest Hospital, just to name a few. In addition to receiving top scores for Praxis exam pass rates, employment rates among recent graduates and on-time completion rates, we love North Carolina Central University because it’s home to a fully accredited clinic: the NCCU Speech and Hearing Clinic. Communications disorder graduate students here enjoy a variety of opportunities for specialized experience through the Assistive Technology for Infants and Preschoolers Program, the Augmentative and Alternative Communication Assessment and Consultation Clinic, and the Bilingual Clinic. We love the University of New Hampshire’s rigorous MS in Speech-Language Pathology program, which includes clinical work in year one. This is complemented with opportunities to participate in the school’s on-campus diagnostic clinic and two externships at two different settings during year two. The university partners with area organizations that offer healthcare, early intervention, and educational externships in New Hampshire, Maine, and northern Massachusetts. The University of North Carolina – Greensboro received a top score among our list of SLP master’s programs for its Praxis exam pass rate, on-time completion rate, and employment rate, and it’s no wonder: they’ve been preparing speech-language pathologists for almost 50 years. The university has also received the distinction of being named one of the top 30 speech-language pathology graduate programs by U.S. News and World Report. We’re also impressed by this program’s nationally and internationally recognized faulty, and the diverse clinical experiences with different patient populations students gain through the on-campus clinic. In addition to earning a 90th percentile score among our preferred SLP programs, the University of South Alabama’s SLP master’s degree offers students loads of clinical practicum experiences, both at its on-campus Speech and Hearing Clinic and through its many affiliate clinics, schools, hospitals, and rehab centers. 100% student achievement scores across the board speak to the quality of this affordable program. The University of Wisconsin Stevens Point’s SLP graduate program nails it when it comes to student achievement: 100% across the board for Praxis exam pass rates, on-time completion and job placement for graduates. It also receives high marks from students because of its innovative speech, language, and hearing clinical training facility. The university also has affiliations with many off-campus sites, including private practices, early intervention programs, and skilled nursing facilities, among others. The Utah State University Speech-Language Hearing Center provides master’s students with ample opportunities to gain valuable clinical experience working with children and adults in the community. We also love the fact that research opportunities are also widely available at Utah State, thanks to its School-Age Language Lab, the Language and Aphasia Neuro-Rehabilitation Lab, and the Speech and Auditory Perception Lab, among others. Southeast Missouri State University may be a large university, but it keeps its SLP grad program small to ensure students here receive the support and mentorship they need to excel when it comes time to enter professional practice. We’re also impressed with the Department’s commitment to providing the best in clinical resources. Recent upgrades to the state-of-the-art on-site clinic include a remote video observation system, digital recording, and an updated student work area. Plus, the new Center for Speech and Hearing includes no less than ten treatment rooms, a diagnostic room with observation area, two classrooms, and a voice treatment room. California State University’s MA in Speech-Language Pathology program impressed us with the fact that 100 percent of graduates passed the Praxis exam for the last five years running, and because every one of the graduates that completed the program in the past six years have gone on to jobs they love immediately after graduating. And did we mention the affordable tuition rates for in-state students? Students here all study under the guidance of ASHA-certified and state licensed instructors and get to put their skills to work on campus at the CSULB Speech-Language Clinic, which provides comprehensive diagnostic and therapeutic services to children and adults in the community. We love the convenience that Chapman University’s MS in Communication Sciences and Disorders program offers working grad students with its late afternoon and evening classes. We’re also big fans of the fact that the program offers school-based and medically-related conditions emphasis options. The clinical training sessions offered here combine the two emphasis areas at no additional cost. Just some of the sites include the Scottish Rite Childhood Language Center, the Brain Injury Treatment Program, and the Head Injury Program at Coastline Community College. There’s so much to love about East Carolina University’s MS in Communication Sciences & Disorders. The program is offered both on-campus and as a distance education program for adult learners and those who are geographically bound. It’s also available with either a clinical and nonclinical track. We’re also impressed with the ECU Speech-Language and Hearing Clinic, a community-based clinic where graduate students can work alongside faculty to provide diagnosis and therapy for adults and children with speech and swallowing disorders. Add to that the fact that on-campus students here can apply for graduate assistantships, and you have one great program. Eastern Illinois University’s Department of Communication Sciences and Disorders enjoys a reputation for being home to a time-tested grad program in speech-language pathology. In fact, for more than a decade, 100 percent of the graduates from the MS in Communication Sciences and Disorders program have found employment within three months of graduation. Plus, it’s also offered as a hybrid/online program, providing busy grad students juggling work and family obligations with the best in flexibility. Marshall University’s MS In Speech-Language Pathology is among our top picks for a number of reasons: A 100% employment and Praxis exam pass rate among graduates, a very respectable showing for on-time completion, and the unmatched hands-on learning experiences students participate in through the Marshall University Speech and Hearing Center, where graduate students work alongside faculty members to provide screenings, evaluations, and therapy sessions for both children and adults. There are loads of reasons why Minnesota State University made our list of top schools offering speech-language pathology graduate programs. For starters, students here have access to special clinics, including the Auditory Processing Clinic and the Regional Assistive Technology Center. If that weren’t enough, the Department of Speech Language Hearing Sciences also maintains more than 33 clinical practicum affiliations in the community and helps foster a wide array of volunteer opportunities where students can gain experience while providing the community with much needed SLP services. The MS in Speech-Language Pathology program through Mississippi University for Women enjoys an enviable student-to-teacher ratio of just 14:1 and a very affordable tuition rate for in-state students. The kind of student-instructor face time that comes as a result of this low ratio contributes to the fact that 100% of students have historically passed the Praxis exam on their first attempt and landed a job they love within three months of graduating. Plus, it’s been ranked as a top Southern public master’s university by U.S. News & World Report. What’s not to love? There are plenty of reasons to love Ohio University’s MA in Speech-Language Pathology: its state-of-the-art facilities, the wide array of clinical experiences the program facilitates, and the many mentored research opportunities available here are just a few. We also love the nationwide network of more than 250 clinical externship sites available to SLP grad students here. Students of the MS or MA in Speech-Language Pathology at PSU enjoy ample research opportunities, both on-campus and with partner departments and institutions in the greater Portland area. Just some of the clinical partners of this program include the Oregon Health Sciences University Medical Center and the VA hospital where students get to work with former and active service members. Add to that the fact that graduates demonstrate a flawless Praxis exam pass rate and employment rate, and you have one of the best programs available for SLP grad students in the North West. Southern Connecticut State University’s MS in Speech-Language Pathology not only offers a strong academic program (as is evident in the fact that graduates enjoy a 100% employment rate and Praxis exam pass rate), but the decided focus on clinical experiences here ensures students get the very best in hands-on training. Students here have access to the department’s three clinical programs located on-site: including the Center for Communication Disorders, the Access Network, and the Southern Connecticut Audiology Services. Plenty of off-campus experiences round out the clinical component of this school’s grad program. We’re big fans of Towson University for a lot of reasons. First, we always love to see a 100 percent Praxis exam pass rate and employment rate among recent grads, and Towson has that covered. We’re also really impressed with their faculty, 90 percent of whom hold PhDs in their area of specialization. We also love the fact that faculty members here regularly engage with graduate students on their research activities and accompany them to national conferences. Towson has a lot to offer its SLP grad students, and in turn, graduates completing the program have a lot to offer patients and clients when they enter the field as licensed SLPs. Just one of the reasons we love the University of Maine at Orono is because it takes a community minded approach to teaching SLP. The CSD department’s Speech, Language, and Hearing Center offers both on-campus and outreach services to children and adults in the community. Add to that a perfect record for Praxis exam pass rates and employment among recent graduates, and it’s clear this program has it all. Plus, the in-state tuition rates here can’t be beat. We think the University of Memphis is great, and that bears out in the solid B+ it earned thanks to stellar student outcomes. But don’t just take our word for it – U of M has consistently earned recognition for its speech-language pathology programs through U.S. News and World Report. The Memphis Speech and Hearing Center has also earned a reputation for providing top-notch services. And this is also where all SLP graduate students at U of M begin their mentored clinical experience. Students here go on to gain faculty-guided experience through clinical sites in and around Memphis. We love the University of Montana’s MS in Speech-Language Pathology program because of its flexibility: it’s offered with either a thesis or non-thesis track, and is available as an on-campus or online program. On-campus students follow traditional scheduling and enjoy all the benefits of a close-knit campus community, including a clinical practicum right on-site at the University’s RiteCare Speech, Language, and Hearing Clinic. Distance education students take all their courses through a web-based platform, and visit the campus only for the hands on clinical training and mentoring portion of the program. The University of Nevada – Reno is a solid choice for a graduate degree in speech-language pathology in the Western U.S. As if a 100% Praxis exam pass rate and 100% employment rate among graduates isn’t impressive enough, the program also offers unprecedented opportunities to gain experience through faculty-supervised clinical externships at affiliated sites, including rehabilitation centers, early intervention programs, public schools, and the VA hospital. In-state tuition here is incredibly affordable, making this program accessible to most. We love how West Texas A&M’s MS in Communications Disorders program caters to different types of learning styles. Students of this program can choose between a thesis or non-thesis option, and the university’s Speech and Hearing Clinic provides graduate students with all the opportunities they could ever hope for when it comes to gaining pre-professional experience and mentorship. Add to that the fact that the program is very affordable to both in-state and out-of-state students and you have a winning combination that works for any eager SLP grad student in the country. The Charles Van Riper Language, Speech and Hearing Clinic is just one of the reasons why we love Western Michigan University’s MA in Speech-Language Pathology program. Students of this program have a unique opportunity to work as clinicians, providing much needed SLP services to people from the local community with diverse speech, language and swallowing disorders. If that wasn’t enough, students here also have the opportunity to gain clinical experience through the Children’s Trauma Assessment Center also located on the WMU campus in Kalamazoo. The University of Northern Colorado’s flexible SLP program offers busy students the option to choose between a primarily online format or a full-time on-campus pathway. In both instances, professors present curriculum that emphasizes evidence-based practice. The program also places students in internships at public schools and medical facilities in the community where they take their classroom and lab-based training into the real world. The University of Vermont easily earns a spot on our list of the top SLP graduate programs in the nation for a number of reasons. Not least among these is the fact that it has a super-low 16:1 student to teacher ratio that gives students a unique level of access to their instructors, and the fact that the School’s Eleanor M. Luse Center for Communication: Speech, Language, and Hearing, serves as an active community clinic that doubles as a primary practice site for first-year graduate students. The University of Wisconsin – Whitewater’s MS in Communication Sciences and Disorders offers the kind of graduate program experience that ambitious students love. This is clear in the fact that 100% of recent graduates passed the Praxis exam first try and all went on to land jobs within just a few months of graduating. We love the fact that affiliated clinical practicum opportunities are available at a variety of rural and urban sites providing students an opportunity to work with a diverse group of patient populations out in the community, as well as on-site through the UW-Whitewater Center for Communicative Disorders. Ball State University is impressive, to say the least. There’s plenty of reasons why Ball State made our list of schools offering top SLP grad programs—the 100% employment rate among SLP program graduates and 100% on-time program completion rate didn’t hurt. But there’s also their BSU Speech-Language clinic, which sees, on average, 120 clients each year. It’s there that SLP grad students can take what they learned in the classroom and apply it in a real-world setting. Add to that an affordable in-state tuition rate, and no less than four assistantships awarded each year, and you have the perfect program for Indiana-based SLP grad students. Support at the College of Saint Rose is all part of the package, with faculty mentoring, program meetings through the Communication Sciences & Disorders Department, and opportunities for active participation in the National Student Speech-Language-Hearing Association. We’re also big fans of the on-campus Pauline K. Winkler Speech-Language-Hearing Clinic, which affords students loads of opportunities to apply what they’ve learned in the classroom in a hands-on environment. Add to that the fact that the school offers the same affordable tuition rates to both in-state and out-of-state students and you have a program that attracts SLP grad students from around the world. A highly individualized approach is standard at CUNY – Queens College. Students of the MA in SLP program enjoy small classroom sizes and an amazing faculty that always seems to find the time to provide one-on-one clinical mentorship. We’re big fans of the fact that students in the close-knit CUNY community learn and study together, participating in weekly clinical seminars that provide opportunities to engage and discuss contemporary issues related to speech-language pathology. It’s no wonder 100% of SLP grad students at CUNY – Queens College complete the program on time and go on to ace the Praxis exam. If you’re looking for a truly immersive educational experience in an academic health center environment, New York Medical College is the place for you. The SLP program here draws from the school’s medically oriented education and training, offering many medical resources to provide students here with a truly exceptional grad program, complete with state-of-the-art clinical and technological tools. Add to that 100% on-time completion rates and employment rates among graduates and very respectable Praxis exam pass rates and you have the total package. The University of Akron understands that not all SLP grad students are in a position to attend class full time on-campus, which is why they offer both a traditional on-campus grad program and a collaborative, distance-learning program. If you’re a working professional, or applying from out of state, the eight-semester, part-time online program is for you. Both the on-campus and online programs offer lots of student support, which is evidenced by the 100 percent on-time program completion rate and near-perfect employment rate among recent graduates. Complete your MS in Communication Sciences and Disorders program at the University of Hawaii at Manoa and you’ll be part of a history of excellence. The Department is housed within the highly esteemed John A. Burns School of Medicine, which has served as a top-tier educational institution and research facility since 1965. Graduates of the John A. Burns School of Medicine provide much of the medical care in Hawaii, and graduates of the MS in CSD are no exception. The 100% Praxis exam pass rate and 100% employment rate among recent graduates speaks to the quality of the program, and the demand for skilled SLPs in the local community and beyond. If you live in Puerto Rico and want to earn your master’s degree in speech-language pathology, consider yourself lucky. The University of Puerto Rico – San Juan is a leading education and research facility with national acclaim. The university boasts a forty-year tradition of producing high-quality-graduates who work for the Department of Health, Education, and Family Services, nonprofit organizations, private institutions, universities, and in private practice. Its reputation as a leader in the training of health professionals is backed by a staff of more than 70 full-time instructors and state-of-the-art facilities. There’s no shortage of opportunities to hone your skills as a grad student of the MS in Communication Sciences and Disorders program at the University of Texas – Rio Grande Valley. This is all thanks to the UTRGV Speech and Hearing Center, a services-learning laboratory where grad students work closely with clinical supervisors to provide services to the public. We love that as an on-campus practicum facility, grad students here enjoy plenty of opportunities to take what they learned in the classroom and apply it in a real-world setting. Clearly, this has something to do with the fact that 100% of graduates complete the program on time and all go on to pass the Praxis exam. Western Washington University provides SLP grad students with the resources and real-world training opportunities they need to succeed in professional practice. If the 100% Praxis exam pass rate isn’t proof enough, the fact that all SLP program graduates go on to find positions they love immediately after graduation surely is. We love the state-of-the-art classrooms and teaching labs found here, as well as the support and guidance provided by graduate advisors. Clinical experiences here are plentiful, thanks to the university’s on-site clinic and the many opportunities students have in the surrounding community, including with the Head Start program, the St. Francis Adult Rehabilitation Center, and the Whatcom Center for Early Learning. SUNY at Buffalo’s master’s degree in communicative disorders and sciences has a long history of student success, and the proof is in the numbers: 100 percent employment rate and 100 percent on-time completion rate among students. We’re also impressed with the university clinic, which is staffed with a clinical faculty boasting expertise in a wide variety of areas, including early intervention, pervasive developmental disorders, articulation, and language, among others. St. Cloud State University’s Speech-Language and Hearing Clinic is just one of the reasons why students of the MS in Communication Sciences and Disorders program here enjoy superb clinical experiences. The Speech-Language and Hearing Clinic is a community clinic that makes diagnostic and therapeutic services available to children and adults in the area. Graduate students here provide assessments and therapy to more than 150 clients each year. At LSU, SLP grad students get an unrivaled learning experience through flipped classrooms, simulated learning, interprofessional clinics, and will soon also get first hand exposure to telepractice. Students here learn to work with eye-tracking equipment, video stroboscopy, and state of the art augmentative and alternative communication devices. In fact, just last year the department invested $82,000 to update it’s ACC equipment. LSU grad students routinely present original research at state and national conferences and have a track record for taking home awards and scholarships. This program has it all. Southern Illinois University is committed to the success of its SLP grad students. The 100 percent Praxis exam pass rate and near-perfect on-time program completion rate and employment rates among recent graduates backs this up. Clinical experience is serious business here, and students are afforded access to a top-notch clinical practice environment at the on-site Speech-Language-Hearing Center. Students here enjoy a fully immersive clinical learning experience in facilities that include no less than eight fully equipped treatment rooms and an observation suite. If you love the opportunities and resources that only a large university can offer, consider Appalachian State University, home to the Beaver College of Health Sciences, which boasts more than 15 laboratories for simulated research and applied laboratory training, more than 150 esteemed faculty members, and a new health sciences building that features innovative classrooms and state-of-the art laboratories. We also love the affordable, in-state tuition and the university’s long history of on-time completion and post-graduate employment rates among SLP grads. Bowling Green State University College of Health and Human Services is the place SLP grad students head when they want the best resources and the best student outcomes. A 100 percent Praxis exam pass rate and a near-perfect on-time completion rate and employment rate indicates a strong program that produces leaders in the field of speech-language pathology. The College’s state-of-the-art facilities support student learning, while close faculty mentoring produces an environment where student success is the number one priority. California State University – Chico is part of the massive, 24-campus University of California system. We appreciate that while the large university environment ensures the best in student support services and facilities, the small Chico setting ensures exceptional, one-on-one faculty mentoring. Plus, many of the program’s faculty have varied research interests and clinical expertise, which ensures that students here receive the best in both classroom education and clinical training. The 100% employment rate among recent MA-CSD program grads speaks to the quality of the program here in Chico. California State University – Fresno is part of the larger University of California system, so students here enjoy the many benefits that come with attending a large, big-name university, while still enjoying the kind of individualized instruction and mentorship that can only come from a community-based campus like the one found here in Fresno. We’re also fans of their well-equipped speech and hearing clinic and the Anna Michelson Memorial Instructional Media Center, where students enjoy access to everything from top-notch clinical equipment to professional journals. No list of top SLP grad programs would be complete without mentioning California State University’s Department of Communication Disorders in Los Angeles. Students here enjoy a prime Los Angeles setting, which affords them access to countless clinical sites, including hospitals, nursing homes, private practice, and public and private schools. We appreciate that while the university is large, the Department of Communication Disorders here is close-knit enough to produce just 24 graduates a year. This smaller atmosphere allows students to receive one-on-one classroom and clinical interactions with faculty members and clinical mentors, something that surely contributes to the 100% Praxis exam pass rate among recent graduates. As a student of CUNY – Hunter College’s SLP master’s degree program, you’ll have access to the best of the best: an affordable in-state tuition rate, state-of-the-art facilities, and access to the vibrant New York metropolitan community where you’ll have no shortage of opportunities to gain real-world clinical experience. This school boasts an on-campus clinical training site where grad students hone their classroom theory, small classroom sizes, and close faculty mentorship—all of which support student success, as is evident in the 100% Praxis exam pass rate among graduates. As a student of Eastern Kentucky University’s MA in Education in Communication Disorders, you’ll enjoy small class sizes and affordable in-state tuition, all with the confidence that comes with knowing that 100% of recent grads found jobs they love immediately after completing the program. We also love the top-notch clinical experiences you’ll enjoy here, thanks to the university’s Speech-Language, hearing Clinic, which provides services to more than 100 clients each year. Eastern Washington University’s Department of Communication Sciences and Disorders offers their MS in CSD through a program that turns out graduates that consistently ace the Praxis exam, boasting a 100% pass rate among recent grads. A prime downtown Spokane location means easy access to a wealth of clinical experiences, and because the program is offered as part of a joint venture with the Department of Speech and Hearing Sciences at Washington State University, students here enjoy access to top-notch facilities, faculty, and resources even beyond the EWU Spokane campus. 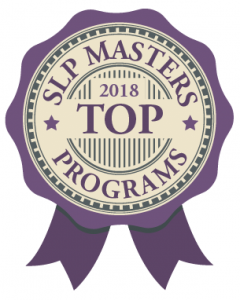 Fort Hays State University’s master’s program in SLP consistently surpasses the accreditation standards for student outcome data, earning it high marks and a solid standing on our list of the top programs in the U.S. This campus-based program provides everything you need to earn your CCC-SLP and state licensure through the Kansas Department of Aging and Disability, all in a program that is super-affordable to in-state students and very reasonable for students from out of state who might be considering studying in Kansas. The Master of Arts offered at Kent State University is a great option for Ohio students interested in a program that focuses on teaching through immersive hands-on training experiences. Clinical practical experiences take place both right here on-campus, as well as off-campus at local clinics in and around Kent. That’s right, externship opportunities that will have you working with pediatric and adult population groups are embedded in the program. This, no doubt, contributes to the fact that all graduates find great jobs shortly after completing the program. The SLP graduate program at Old Dominion University keeps students sharp and engaged through diverse learning methods that include supervised on-campus and off-campus practicum experiences, evidence-based case study projects, and written comprehension exams. And naturally, the program is all about preparing students to succeed in becoming certified through ASHA upon graduation, with graduating classes consistently boasting a 100% Praxis exam pass rate. The Department of Communication Disorders & Sciences at Rush has a clear mission: Provide an outstanding grad level education in accordance with the teacher-practitioner model with a commitment to the best patient care and excellence in research so as to bring the highest quality SLP services to diverse communities. Rush University’s master’s program in SLP offers students the choice of either a thesis or non-these track. The program includes clinical experiences that give attention to intervention procedures and structured observations of assessment to complement the top-tier classroom-based instruction. In addition to covering your bases by giving you everything you need for ASHA certification and state licensure in New York, St. John’s master’s in SLP helps foster a global perspective on communication disorders with an exciting study abroad opportunity in Guatemala and an open invitation to apply for a Bilingual Extension Certificate (BEC). Add to that conventional training in the school’s Speech and Hearing Center and you have a program that offers it all. The Communication Sciences & Disorders Department at UW at River Falls earns bragging rights for turning out graduating classes that consistently boast a 100% Praxis exam pass rate. This might have something to do with the diverse training experiences students get here. If UWRF’s on-site Speech-Language-Hearing Clinic wasn’t enough, students also interact with the SLP community through clinical externships that span 31 medical/rehabilitation sites and 24 public school settings. To prepare students for careers in diverse environments, externships are provided in suburban, urban, and rural locations. The SLP program at University of Wyoming is all about learning by doing, introducing students to the local SLP professional community through clinical rotations in nearby Cheyenne, Laramie and the surrounding areas. Clinical externships in medical and educational settings act as the perfect complement to the stellar classroom instruction students receive here. Students here greatly benefit from collaborative and independent research projects. Maybe all this is the reason why 100% of students graduate on time and all graduates land great jobs shortly after completing the program. Western Illinois University’s SLP master program springboards students into successful careers with a focus on rigorous clinical training, full-time off-campus internships, advanced coursework, and practical exercises at the WIU Speech-Language-Hearing Clinic. Using small class sizes, the SLP staff ensures students are well-prepared for state licensure and ASHA certification. As if a100% Praxis exam pass rate among recent grads isn’t impressive enough, 100% of grads also go on to land jobs they love shortly after graduating. This SLP instruction plan at William Paterson University is complemented with plenty of research seminars, externship rotations, and trips to the school’s on-campus Speech and Hearing Clinic. Graduates Typically enter into the job market already holding their CCC-SLP, New Jersey State license, and speech-language certification from the NJ DOE. Maybe that has something to do with the fact that 100% of graduates transition to great jobs as soon at they complete the program. If you want a school that will provide you with a great education and plenty of resources, consider Southeastern Louisiana University, which boasts everything from a university-based Speech-Language Hearing Clinic to plenty of contractual agreements that ensure students have no shortage of exciting field experiences through regional schools, hospitals, private practices, and rehabilitation centers. Add to that an award-winning professional student organization that is sure to enrich any student’s graduate experience and you have all the makings for one of the best SLP programs in the nation. University of DC’s master’s in SLP puts a decided emphasis on improving the quality of life for patients with speech disorders, looking at the sociocultural and sociolinguistic implications of speech therapy interventions. This program further distinguishes itself by offering a route to specialization in either school-based or medical speech pathology. With several on-site research facilities including its Center for Excellence in Early Childhood Learning and Development, East Tennessee State University makes hands-on learning a central part of its SLP program. And it’s an effective approach as is evident in the fact that 100% of grads ace the Praxis exam, and all go on to great jobs shortly after graduating. Students are invited to participate in off-campus clinical experiences through area school systems, long-term health care facilities, hospitals, and nursing homes. Governors State University encourages students to gain experience in the most immersive environments possible: the real world of schools, hospitals and clinics. In fact, the Communication Disorders Department has a network of over 150 affiliate practicum sites throughout the community. This immersive training model helps students move seamlessly from college life into the real-world of professional practice. For added convenience, the school offers students both full-time and part-time scheduling options. Idaho State University puts a master’s in SLP well within reach for grad students in the state and throughout the country with programs available at the Pocatello and Meridian campuses, in addition to a super convenient online option. The curriculum includes full-time externships where students gain experience working with clients across the lifespan dealing with a full range of speech and swallowing disorders. Stats above are shown for the Pocatello campus. At Meridian, they differed only slightly: Praxis exam pass rate – 100%; on-time program completion rate – 81%; and Employment rate – 100%. Illinois State University’s MS in SLP allows students to custom tailor their learning experience with electives that prepare them to go on to specialize in medical or school-based practice, as well as bilingualism. Department faculty includes clinical coordinators available to help connect students with more than 500 affiliate sites available to accommodate internships. This helps explain why a full 99% of graduates go on to start careers with employers they love immediately after completing the program. Jackson State University’s MS in Communication Disorders program has set a precedent for turning out graduates well prepared to succeed as professional SLPs. The numbers speak for themselves: 100% of recent graduates pass the Praxis exam and all find jobs they love almost immediately after completing the program. In addition to being prepared for the CCC-SLP and state licensure from the Mississippi State Department of Heath, graduates also qualify for the Class AA Standard Educator–SLP License through the State Department of Education. The MA in SLP through LIU Post prepares graduates to work as part of a team in collaboration with other therapists and practitioners, from applied behavior analysts to physical and occupational therapists. Aside from the basic CAA-approved course requirements, students get a chance to try out what they’ve learned in the classroom and polish their practical skills through four separate clinical experiences, both on-campus, and at area hospitals, schools, and rehab centers. The fact that 100% of students complete the program on time and 100% of graduates pass the Praxis exam and land jobs shortly after graduating tells the story of how effective this program is. At Longwood University, SLP grad students enjoy small class sizes that provide lots of opportunities to work closely with instructors and classmates. Longwood’s Social Work & Communication Sciences and Disorders Department also provides just as many opportunities for hands-on, experiential learning in the school’s ultramodern Speech, Hearing and Learning center, observable therapy rooms, and pre-school literacy room. The program also encourages students to work cooperatively with clinical faculty to practice interprofessional relationship building. In addition to its highly rated speech-language master’s degree program, we also love the fact that Misericordia University offers an option for undergrads with their sights set on becoming a board-certified SLP, offering a comprehensive program that will take them from a high school diploma to a master’s degree in speech-language pathology in just five years. Of course, traditional SLP graduate students are welcome too. Across the board, the perfect student achievement scores speak for themselves: 100% Praxis exam pass rate, on-time graduation, and employment rate among recent graduates. Missouri State University has all the bells and whistles you’d expect from a large university: state-of-the-art laboratories and clinics, a highly esteemed faculty, and loads of research opportunities. Yet this school still manages to offer its SLP graduate students a very affordable option and a personalized experience, complete with close faculty mentorship and small class sizes. New Mexico State University produces leaders in the field of speech-language pathology, which is evidenced by the 100 percent employment rate among graduates for the past several years. While this university is large enough to offer plenty of opportunities, clinical experiences, and top-notch laboratories, it’s still able to maintain a small school atmosphere. Northeastern State University will get you where you want to go with your master’s degree in speech-language pathology, as it prepares students to earn the Certificate of Clinical Competence (CCC) from ASHA, a license from the Oklahoma Board of Examiners for Speech Language Pathology and Audiology, and the Oklahoma State Department of Education Standard Certificate in Speech-Language Pathology. Do you want to teach in the public school system? Northeastern State has you covered, thanks to the 13 school contracts it maintains. No matter where you live, Ohio State University may be the ideal school for you thanks to its standard tuition rates for both in-state and out-of-state students. In keeping with the Department of Speech and Hearing Science’s tradition of distinguished faculty, in the past year alone, they recruited and hired three new senior faculty members, all of whom come with their share of outstanding research credentials. Ohio State also offers up several graduate interdisciplinary specializations—aging, applied developmental science in education, disability studies, and singing health—to provide students with plenty of opportunities to focus their graduate work on an area of interest. San Diego State University has all the perks you’d expect from a large, internationally renowned university, including contractual relationships with community clinics, schools, hospitals, and health agencies and a large audiology and speech-language clinic, which provides plenty of opportunities for graduate students to get a variety of diagnostic and rehabilitative experiences under their belt. We also love that they offer students the option of specializing in bilingualism—a great addition to any SLP graduate program. The University of Central Arkansas may have some 60,000 students that make up its student body, but we love that it is still able to maintain a small-school atmosphere for SLP graduate students. You can attribute this to UCA’s top-notch advising services, faculty mentorship, and diverse clinical experiences. In fact, the faculty here make it a point to get to know students, showing a unique commitment to producing the next generation of clinicians, educators, and researchers. The University of Louisiana at Monroe offers a master’s degree in speech-language pathology that immediately caught our attention when we discovered that the program has produced graduating classes with a 100% pass rate on the Praxis exam for seven, consecutive years. But we’re also impressed with the low in-state tuition costs and the Kitty DeGree Speech and Hearing Center, which serves as an integral part of the Department of Speech-Language Pathology and the College of Health Sciences. This clinic has served as a community and graduate program resource for more than 40 years. Annually, it conducts more than 400 screenings and evaluations and provides more than 4,000 hours of therapy to patients in the community. We love the University of North Texas for its super-competitive in-state tuition, its 100 percent Praxis exam rate, and the UNT Speech and Hearing Center, the place for graduate students to dive deep and gain valuable, real-world experiences treating clients in a real clinical setting. With a track record for producing graduates with a 100% Praxis exam pass rate and a very respectable showing for on-time completion and post-graduation employment, this program offers eager SLP grad students the total package. The University of West Georgia is committed to creating the highest quality student experience, which is why this school admits just 20-25 students each year into its SLP master’s program. In addition to fantastic faculty mentorship, this school provides students with plenty of opportunities to learn through experience in the Comprehensive Community Clinic. It’s safe to say this has helped stack the numbers here, with 100% of students completing the program on time and all of them going on to land jobs they love shortly after graduating. The University of Wisconsin at Eau Claire is all about convenience and flexibility, which is why they offer both a residential and online master’s degree in SLP. Their residential program will get you in and out the door in just two years, while the online option is designed as a three-year, part-time program for working professionals or those who just prefer a distance-learning platform. But what’s really impressive about this school is that in four out of the last five years, they’ve maintained a 100 percent first-time pass rate on the Praxis exam. Plus, they proudly boast that 100 percent of their graduates are employed in the profession within one year of graduation. Choose Wichita State University for your SLP graduate studies and you’ll have access to plenty of perks when it comes to real-world clinical experience opportunities: if the on-site WSU Evelyn Hendren Cassat Speech-Language-Hearing Clinic wasn’t enough, you’ll also have access to a wide number of externship options in and around the Wichita area. With a very respectable showing for Praxis exam pass rates among recent graduates and a 100% employment rate, you can be confident this program will prepare you for a successful career. In addition to its affordable tuition and the impressive on-time completion and employment rates among students, we’re really impressed with the flexibility of Eastern New Mexico University’s MS in Communicative Disorders. This grad program offers a unique hybrid of online and on-campus coursework that is ideal for working SLP grad students. Students here attend the first 16 weeks of the program on-campus to complete a one-semester practicum. After the successful completion of the practicum, students can then complete the remainder of the program exclusively through distance-based study. We admire Radford University’s Department of Communication Sciences and Disorders for its impressive track record of producing highly employable graduates (employment rate near 99 percent) and the fact that all students complete the program on time. But we love its three-year leveling track option, a feature of the program designed specifically for students who didn’t complete their undergraduate degree in communication sciences and disorders. Students that take advantage of this option complete an additional 28 credit hours of coursework during their first year and then seamlessly transition into standard graduate program coursework. Western Kentucky University makes earning a graduate degree in speech-language pathology convenient and accessible for students. Thanks to its flexible coursework delivery options, this first rate program is available in three formats: on-campus, online full-time, and online part-time. We’re also impressed with this university’s campus offerings, including the Communication Disorders Clinic, which serves the community by providing speech, language, and hearing services to more than 120 people each year. All student achievement data was taken directly from each school’s website. Scoring is based on the three-year average percentage in each of the three categories (Praxis exam pass rates, on-time completion rates, and employment rates). We looked at the three most recent years of available data for each school. In virtually all cases, this was the 2014-15, 2015-16, and 2016-17 academic years. For the few schools that have not yet posted 2016-17 data, we looked at the 2013-14, 2014-15, 2015-16 academic years. All tuition data came from the U.S. Department of Education’s Institute of Education Sciences National Center for Education Statistics (IES-NCES) database. IES-NCES provides annual tuition data for each school as an average of all graduate programs the school offers. All cost and affordability scores are based on how each program’s costs compare to the average within their own state and for their respective category (public or private). Note: As a rule, for schools that offer the exact same program at multiple campus locations or both on-campus and online, we scored and provided data for the location or delivery format with the best student outcomes. In a few instances where additional campus locations represent the only option for SLP education in the region, we scored and provided data separately for these locations. * The 25% spread in our scoring system allowed public universities to be able to compete in this category. Though public schools typically charge a considerably higher rate to out-of-state students, it is becoming more common for them to offer the same rate across the board as a way to be more competitive and to attract international students and students from elsewhere in the country. Though private universities charge higher tuition rates than state schools, they typically offer the same rate regardless of residency status. Public schools routinely offer tuition rates that align with other state schools, but since private universities aren’t bound by the same restrictions their rates can vary widely from the mean and place them outside the allowable range for being awarded points. By including this category, we were able to create a more equitable scoring system that ensured both public and private schools have an equal chance of qualifying for inclusion on our list.